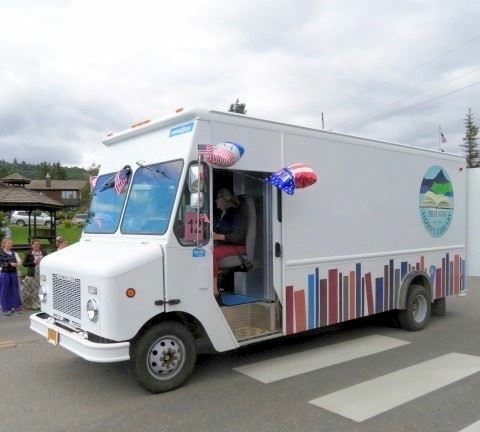 BOB the Bookmobile was purchased in 2016 from a small library in Glenallen, Alaska. From the beginning, our goal has been to use the bookmobile for library outreach. "BOB" stands for "Books On Board" and we strive to bring books to kids across the lower Kenai Peninsula service area. We operate a book exchange: bring a book, take a book. Or take a book and drop it back off at the Homer Public Library at your convenience. Library cards are not required. However, if you don't have a library card or haven't visited in awhile, we hope BOB will inspire you to make a visit to the Homer Public Library! We are in constant need of good quality kids books and we love all kinds of donations. New books, books you have outgrown, books that were not quite your taste...drop them off back at the Homer Public Library. In the summer BOB can be found visiting parks during peak play times. In the fall, BOB visits area schools and each child gets to pick a book to keep. Come read a story with us and play! read the new book on the Story Walk! BOB heads to the beach! BOB the Bookmobile in the 2017 4th of July Parade.